I had no luck finding a subtitled version of this film (legal or otherwise), which is a shame as I think that difficulty will stop a lot of people from watching. I’m not sure where Heather got her subtitled copy from. However this is the story of a dancer, often expressed in action rather than speech and many scenes required no further explanation. The film uses a flashback structure so we actually meet the older Balu (Kamal Haasan) first. He is a disgruntled drunk and newspaper critic who, despite all his issues, demands a high standard for dance. He writes a scathing review of the latest dance sensation Sailaja (SP Sailaja), and rather than apologise when she confronts him, belittles her by showing her how it should be done. Young Balu is a poor boy, dedicated to dance in many forms – and a purist. He wants to be successful but is held back by his dislike of the shallow sexified version of dance that is in demand (and is perhaps dismayed by the outfits). Balu’s world is small. He has his mother, dance, and his friend Ragu (Sarath Babu). He also meets Madhavi (Jayaprada) who is wealthy and happy to be his patron. She gives him many opportunities, and becomes more than a sponsor in his eyes. Each episode reveals something more of Balu’s character and how he came to be in his current situation. It’s a big challenge for a film maker, and in this instance it is handled beautifully by K. Vishwanath. The fragments fall together to make a cohesive story, and it is easy to follow the narrative. Kamal Haasan is fantastic. Since we more or less know how the story ends before it begins, it really does require a great performance to keep a viewer engaged on the way to the foregone conclusion, and he delivers. 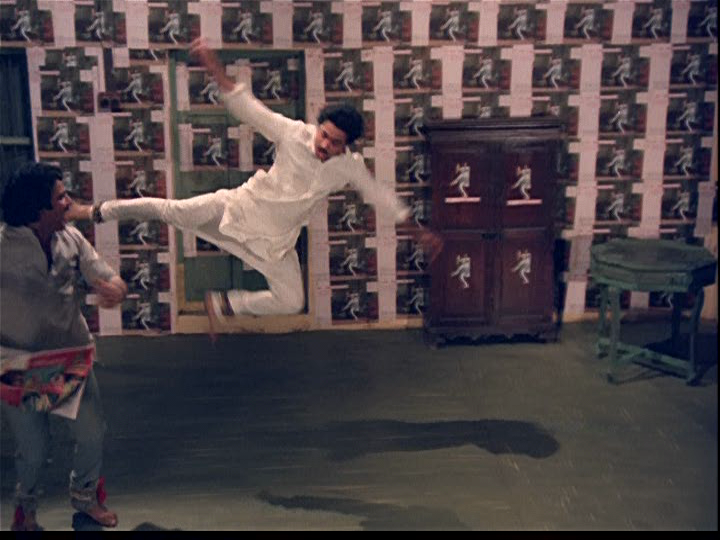 Yes, there are some dubious wardrobe moments and bizarre posturing, but they were intentionally ridiculous, being Balu’s commentary on the commercialisation of dance. Balu dances his joy, pain and despair – he dances his heart out and it is hard to look away. This is one of my all time favourite film dance sequences and I love it for its joyous emotion, simplicity and the brilliant editing. Despite his dedication to dance as a pure art form, Balu isn’t a total stick-in-the-mud. He adds some sweet comedic flourishes dancing with kitchen utensils, and plays up to his mother who dreams of seeing Balu on stage. Madhavi is impressed too! Life seems set and success is just around the corner so naturally, I expected a tragedy. Because he is such a perfectionist and intolerant of things that don’t fit his vision, Balu is ill equipped to deal with setbacks. 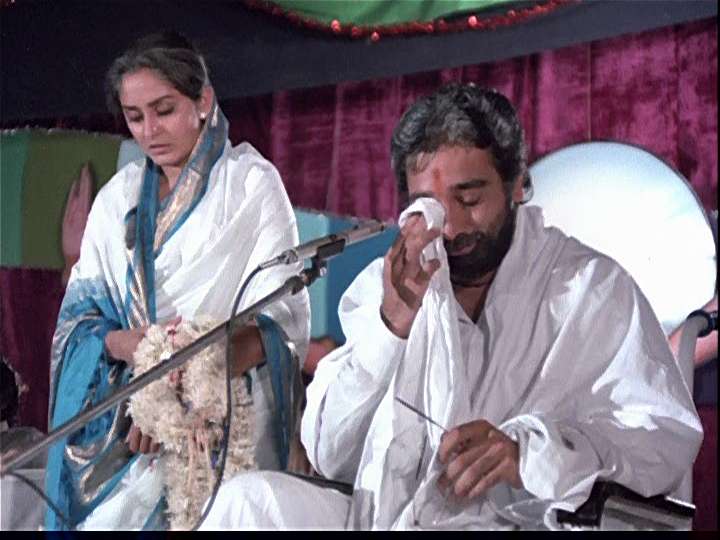 He falls into a bottle after losing his mother, missing his big dance debut and then learning that Madhavi is not free to return his love (she is married to a man who looked absolutely miserable in their wedding photos). His character frustrated me greatly. I could empathise with Balu, but I really wanted him to see sense and find a way to bend before he broke. Sarath Babu’s role was small but he is a constant and reassuring presence and instilled Ragu with an air of integrity and generosity. I’m not entirely sure why Ragu stuck by his friend as he seemed to give endlessly to an often ungrateful sod. There were lively glimpses of Balu’s character in a couple of scenes that made me believe in the friendship, and perhaps I missed a lot in the dialogues. Madhavi tracks down her old friend and would be lover through the newspaper and Ragu. Her side of the story is also revealed through flashbacks. This episodic style seems apt as her love for Balu is revealed through her candid and perceptive snapshots of him long before either of them acknowledges any feelings. Jayaprada is lovely and manages to be light and funny as young Madhavi without being shrill or giggly, ably matching Kamal Haasan in the physical comedy. She gives a sensitive portrayal of a woman who is tempted by a love she cannot act on and manages to be sympathetic despite having been, at best, deceptive by omission. As it happens, she is Sailaja’s mother, and so Balu’s life turns back on itself as Madhavi secretly engages him as a dance teacher for the stylish but shallow girl. The photograph motif is used a lot. One of the most moving examples is when Balu and Madhavi try to use the timer thingie to take a picture of themselves together. The photo fails and all that can be seen is a worried Madhavi and ghostlike blur of Balu. They joke that it wasn’t meant to be. Then when Madhavi departs with her husband, Balu takes and keeps a photo of the couple as a reminder to himself of what had to be. It’s one of the few pictures he takes; usually Madhavi was the one to give him beautifully composed portraits showing what he was to her. Their reunion is full on filmi and yet simple as Madhavi confronts Balu while he is stinking drunk. Balu’s drunken cavorting avoids being a mockery of his dance despite being accessorised with a bottle, perhaps as it comes straight from his heart with no artifice. Madhavi lets Balu see her sadness and fear for him while he seems to give her an earful for not teaching Sailaja to be a better dancer. In so many ways, they haven’t changed a bit. Balu doesn’t know that Madhavi is a widow, and once more she struggles with the pressure of family against her desire to move forward with Balu in her life. Sailaja is unhappy at this revelation about her mother’s past, but she should be practicing her dancing more than spying, and do a bit of growing up as well. Happily for her, she does come around to seeing the value in Balu’s teaching (which he does from a hospital bed). Her performance was probably the weakest for me in terms of acting, but her dance scenes with Kamal Haasan were much more satisfying. And SP Sailaja can sing, so she was certainly talented. The structure of the story is solid, and the characters seem believable. The Illaiyaraaja soundtrack is integrated into the drama and the dances reveal so much of the characters’ inner lives they are essential to the film, not just a pleasant addition. The dance practice and performance scenes are filmed beautifully. I can’t comment on the lyrics by Veturi or the dialogues co-written by K. Vishwanath and Jandhyala (who wrote dialogues for Aaradhana) as I just made up what I thought was happening in some scenes. The ending is over the top but despite all the silly trappings the leads keep it (mostly) restrained to let their characters’ emotions shine through. If nothing else grabs you, this film captures some exceptional dance performances. I wish I could fully appreciate the characterisations, as I did feel disconnected at times due to my lack of language skills, but it wasn’t a huge issue. 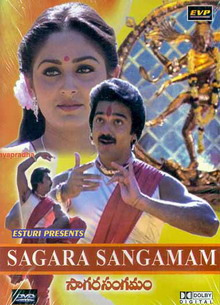 I give Sagara Sangamam 4 ½ stars. Heather says: This is such a beautiful film and although I keep returning to it time and time again to watch the incredible dance scenes, there is so much more to enjoy in this film. To start with the dancing, there probably isn’t anyone other than Kamal Hassan who could manage to make it all look so effortless. The classical dance scenes are superb, and even the contemporary song (with that truly hideous yellow suit) is well added in to showcase his skills. Jayaprada is beautiful in her dance scenes and S P Sailaja is excellent, but it’s still Kamal Hassan who draws my eye each time. I absolutely love the dance scene in the kitchen which is fresh, spontaneous and makes such good use of the setting. Leaving aside the amazing dancing, this is a really well told story. An alcoholic ‘hero’ is unusual and, since I work in the field, I like that it’s a useful public health message as well. The romance between Balu and Madhavi develops slowly and naturally considering their joint love of the arts and despite the difference in their social standing. The use of photography to link the story together is cleverly done and every image adds a little more to the story. Sarath Babu is excellent as Balu’s long suffering friend, and his generosity provides a stark contrast to Balu’s increasing selfishness as he beomes dependant on the demon drink. However Raghu is not a perfect saint either since he doesn’t scruple to use Balu’s guilt against him as a way to blackmail his friend into teaching the spoilt brat Sailaja. Of course it’s all for Balu’s own good and the fact that he gets treatment for his sick wife Sumathi is a bonus. All of the supporting cast is excellent here and K. Vishwanath develops their characters in enough detail to make their actions understandable and relevant. I really like the way each flashback occurs when something which is happening in the present triggers a memory of a past event by one of the characters. It seems very natural and helps to link the past and the present. The film is very much about the arts: Raghu is a writer and poet, Madhavi is a singer and Balu’s dream that they all perform together seems a natural extension of their friendship. It’s also an excuse to have some beautiful songs and once again Illayaraja provides music that I love and I just wish I knew what the lyrics meant. There are a few things I don’t enjoy quite so much. There are some really ridiculous co-incidences and the last few scenes are overly melodramatic. But then again this is a film from the eighties and we all know that wasn’t a time for restraint! This is a 5 star film for me. While Bollywood has just started to show kissing scenes and Hollywood is slowly integrating gay storylines into films, director Onir has moved much further ahead with his latest film. 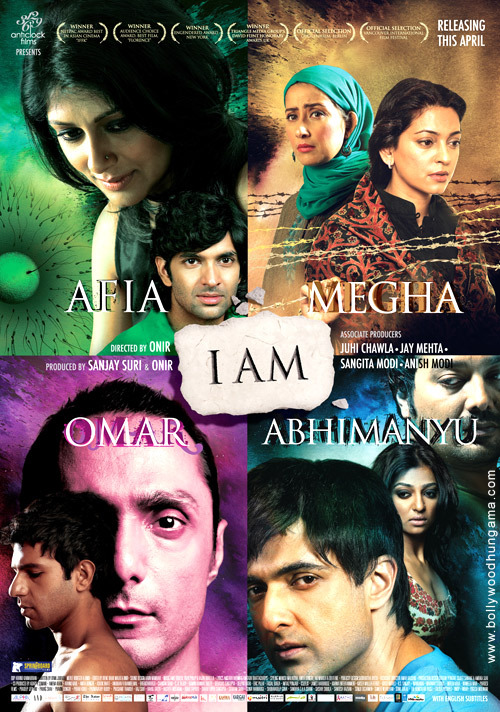 I Am is a confronting and thought-provoking collection of 4 stories which deal with subjects commonly not spoken about in public and rarely seen in mainstream film. In addition to its subject matter, the film is novel in that funding was partly achieved through social networking and has over 400 producers. Onir and Sanjay Suri initiated a page on Facebook where people were invited to sign up to help finance the film or volunteer their time. Manish Malhotra for example designed the costumes for free and many of the actors did not receive any remuneration. Also, somewhat unusually, there are three directors who appear as actors in the film; Anurag Kashyap, Anurag Basu and Nandita Das. I Am has won acclaim in a number of film festivals, a number of awards already, and luckily for us premiered in Australia as the closing film for the Indian Film Festival. As an added bonus, Onir and Juhi Chawla were present at the screening I attended in Melbourne to introduce the film and to take part in a Q and A session afterwards. My favourite actress, a director whose previous work I’ve enjoyed and his brand new film all adds up to a perfect way to spend an evening. The four stories are loosely linked together by friendships, connections and chance meetings between the characters, and this works well as a connecting thread without feeling too contrived. 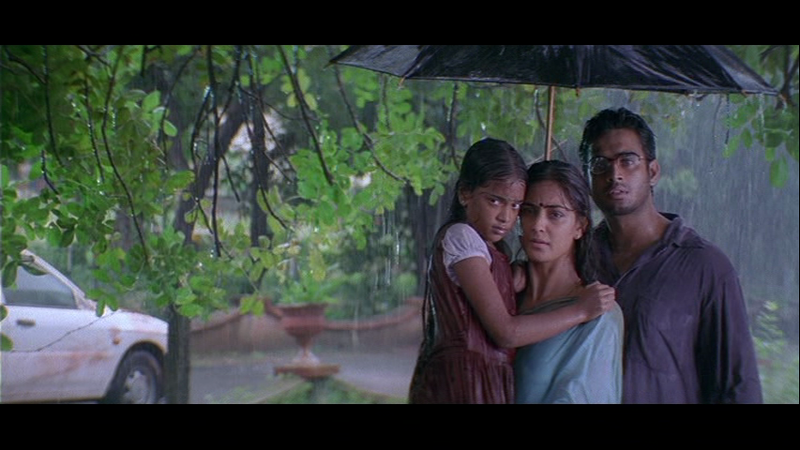 The first story is Afia’s (Nandita Das)and deals with her determination to have a child by herself after her divorce. 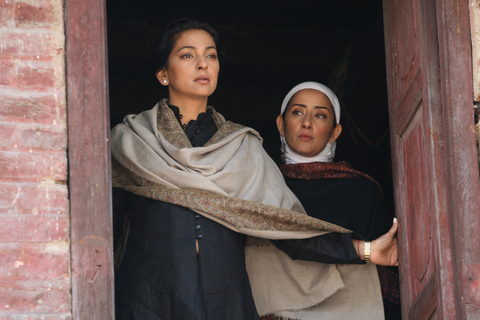 Her friend Megha (Juhi Chawla) speaks as the’ voice of society’ condemning Afia for what she perceives as selfishness and the story raises a number of questions around the issues of single parenthood and artificial insemination versus adoption. The debates between Afia and Megha are honest and natural and the conversations Afia has with a number of her male acquaintances as she looks for a sperm donor ring embarrassingly true. Onir described Afia’s story as the most ‘Bollywood’ and it does follow a more traditional story telling path compared to the rest of the film. I don’t relate to this story personally as Afia’s decisions would not be mine, although I mainly agree with her right to choose. The second story is Megha’s own and describes a trip she makes back to Srinigar for business, having left the area some twenty years before with her family as part of the Kashmiri Pandit evacuation. She stays with her childhood friend Rubina (Manisha Koirala) and the contrast between the two women; one who was forced to leave and one who had to stay, forms the focus of this section. The suffering on both sides is evident and Rubina envies Megha’s freedom of living in Delhi away from the continual threat of fighting. Megha in turn resents having had to flee the violent attacks on her family. Srinigar looks very similar to my home town of Belfast in the seventies, with bombed out buildings, soldiers everywhere and the ubiquitous presence of barbed wire. But behind the rubble there is still beauty in the landscape and Onir manages to capture this equally as well as the devastation. This was a very touching story and I was surprised to read in the statistics at the end of the film just how many people were displaced as this is something I know very little about. The third story is that of film maker Abhimanyu (Sanjay Suri) and deals with the taboo subject of child abuse. We see that Abhi was abused by his step father as a child and this is his story about finally being able to speak up about his childhood. Abhi has recurrent dreams of his mother and many of the scenes also have a dream like quality as if Abhi can only bear to relive them a step removed. There is a well-defined contrast between Abhi’s party life style and large group of casual friends and the scenes where he confronts his past with his close friend Apama. Throughout the story Abhi is conflicted about his sexuality and his childhood experiences have had an obvious effect on his ability to form relationships. This is a very difficult subject to film but Onir and Sanjay manage to deal with it sensitively and the story is well told. The final story is the most shocking for me in many ways, not because it features men kissing, but because of the events that follow. This is Omar’s story and explains how Section 377 of the Indian Penal Code is used to extort money – and more – from homosexual men. Omar is a hustler picked up in a bar by Jai before they are spotted by a corrupt cop. The confrontation is graphic and detailed, and it’s very disturbing to know that it is based on true accounts. Onir expressed his amazement during the Q and A session that the film got through the censors without getting any visual cuts (mainly referring to this story) and I am amazed along with him. Some of the dialogue was muted, however the subtitles were abundantly clear as to the viciousness of the scene depicted despite the many ****’s. Rahul Bose as Jai was incredible in this and was able to effectively portray subtle changes in Jai’s mannerisms as a consequence of his experience. I am very impressed with his performance as he really made me believe this story, much as I didn’t want to. The film starts with an easy to digest story and ends with a truly sickening one. The progression is deliberate and the style of shooting changes along with the dialogue delivery. Afia’s story is shot with open angles and plenty of space, but by the time we reach Omar’s story the style is much more closed in and claustrophobic. The dialogue becomes more graphic in each story as does the action on-screen. I find it hard to describe my feelings about this film – I can’t say that I enjoyed it, because I felt too uncomfortable while watching. And it’s not a film to be enjoyed as such anyway. It is brilliantly filmed – the actors are outstanding and the stories themselves are very well written and I can appreciate it as a work of art. It would be more accurate to say that I enjoyed the experience and think that the film is excellent, just not one for everyone’s tastes. Thought-provoking and challenging, I Am gets 4½ stars. I watched Kannathil Muthamittal when a number of people recommended it to me after I worked in refugee camps in Sri Lanka. I think that my experiences there have really coloured my view of the film as I do focus more on Shyama’s story and less on the main characters. That said, I think the story is well told and the actors all do a good job – it’s just not the story I wanted to see. It’s a classic Mani Ratnam film with strong female characters, great cinematography and attention to detail, so it’s no surprise that the film won six National Awards. The film opens with the wedding of Shyama (Nandita Das) and Dileepan (J. D. Chakravarthi) in their village located in northern Sri Lanka. Despite this happy start it’s not long before Shyama is pregnant and on a boat heading for a refugee camp in India while her husband is missing, presumably fighting for the LTTE. Once she gives birth in the refugee camp, Shyama leaves her daughter behind and heads back to Sri Lanka to try and find her husband. From here the film skips forward in time to introduce G. Thiruchelvan or Thiru (Madhavan) and his family, as seen through the eyes of his adopted daughter Amudha. Convincingly played by P S Keerthana, she appears to be a typical precocious 9 year old; playing with her friends at school, teasing her two younger brothers and very definitely the princess in the family. The story of her adoption is told in flashback and shows the development of the romance between Thiru and Indra (Simran). I really like this part of the story as the two leads play their parts well and the intertwining of the adoption story and the romance is really sweet. After she is told by her father on her ninth birthday that she is adopted, Amudha becomes moody and withdrawn and finally demands a chance to meet her real mother in Sri Lanka. For some inexplicable reason her parents accede to her demands and the family head off to the war-torn nation, although they did have the good sense to leave their other two sons behind. The scenes in Sri Lanka make me cry every time I watch this film. I have seen the same mix of resignation and total despair on people’s faces that is shown here when a village is evacuated. I worked on the East Coast and regularly travelled between LTTE and government controlled areas. The incredibly young soldiers with their automatic weapons shown in the film is very much true to what I experienced and for me this total realism clashes with the more idealistic search for Shyama. Mani Ratnam wisely doesn’t attempt to explain any of the conflict, only showing its effects on Indra and Thiru as they realise why Shyama left her baby behind. Amudha becomes bratty and rude as she deals with her feelings of alienation from her family and as a consequence I lose much of my sympathy for her. I also disagree with her parents’ decision to try and find her birth mother, no matter how essential it is to the plot. However both Simran and P S Keerthana convey their conflicting emotions and fluctuating relationship well and Indra’s inner conflict as she worries about her two sons left behind in India is effectively depicted. Although Amudha is irritating the young actor does hold her own against the more experienced cast and it may be more due to the over emotional story that I lose interest in her search. Madhavan’s character, although impressive in the beginning, seems to have little impact in the latter half of the film and Prakash Raj is wasted in his role as the doctor taking the family around Colombo. So while I enjoy the first half of the film, the second half tends to drag with the adoption story and the peripheral action is more engaging . Some of Amudha’s rebellion in this section could have been cut without losing the feeling of her isolation and separation from the rest of the family. The ending is also a little disappointing but Mani Ratnam shows restraint in not turning the final scenes into melodrama, which could easily have occurred given the subject matter. What I do like about the film is that it looks beautiful and is well shot by cinematographer Ravi K Chanran. Lighting is used to good effect as the early scenes in the family home are filled with warmth in contrast to the rain and grey skies in the later part of the film. While the background score of the film by A. R. Rahman is both beautiful and haunting, some of the songs are a little intrusive. The story doesn’t really need dance numbers and they seem to interrupt rather than move the film forward. This isn’t a film I particularly enjoy watching, probably more because of the memories it evokes, although I can see why it won awards and I do think it’s generally well acted. It’s just that I would have preferred to see more of Shyama’s story and less of the family drama. 3 stars from me, mainly for the first half. Temple says: This is one of the first Tamil films I saw a few years ago, and I was prompted to pick it up because of the storyline and for Madhavan. Thiru (Madhavan) fell in love with the idea of giving Amudha a home and family, and I always feel that if Indra hadn’t agreed, then someone else would have been procured to play wifey. His decisions all revolve around what he wants – the way he courts Indra, the adoption, telling Amudha and persisting when it was clear she wasn’t ready for this birthday surprise, and on it goes. The job of explaining and reassuring was left mostly to Indra, and she had to bear the emotional burden of seeing her little girl in torment as she herself struggled to cope. Simran is lovely as Indra, but her character is surprisingly weak considering the way she met Maddy, and her being a news anchor. I expected more backbone, but the women in Mani Ratnam films are often written like this – a strong outline and not a lot of finer detail to make them seem more real. I was adopted and my mother told me every day, long before I even knew what words were, so it would never come as a shock to me and to make it clear that ‘adoption’ isn’t a dirty word. My perspective is coloured by that and while I can understand the bratty Amudha wanting to know her own story, I will never understand her adoptive parents taking her into a war zone no matter how much she sulked. Still, the treatment of her story in terms of her developing understanding, the legal adoption process, and the fallout once the truth emerged was handled in a much more credible manner than many other films with orphans scattered around the streets, under cabbage leaves, going free to a good home. The prologue was excellent in setting the scene, but beyond that Shyama and Dileepa didn’t really fit. 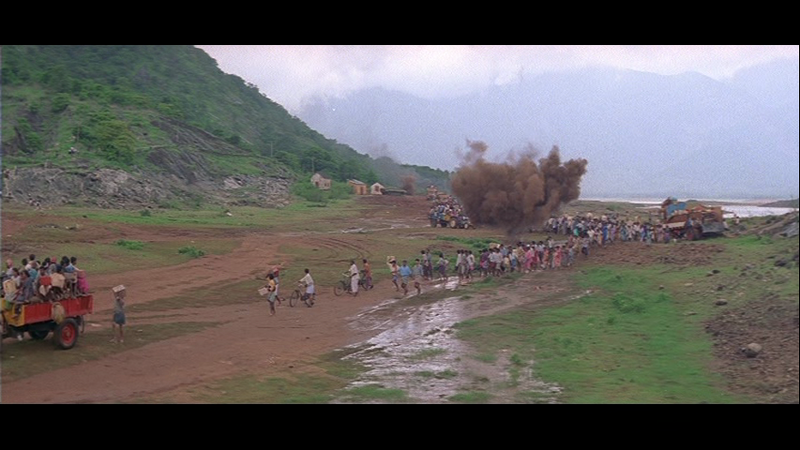 The context of the Sri Lankan conflict added another dimension, but also made the second half of the film too dramatic and improbable when they went looking for Shyama. So although a fascinating and moving topic, here it is just used as a background for the family weepfest. The soundtrack works well in the film, but I find the songs bland. The picturisations are beautiful, most are very stylised, however I can only take so much fabric blowing around and children running on the beach. They suit the mood of the film, but having seen them before, I made a cup of tea during a couple of songs this time. I felt the same about the story device for the flashback – the handwriting and drawings became a distraction and took my focus off the action. Pretty visuals just aren’t enough to keep the film on track. When Mani Ratnam wants to belt you over the head with a message about peace, unity, love and what makes a family, he can make Bono seem subtle. I give it 3 stars.